Bamboo artworks can be found on this page. 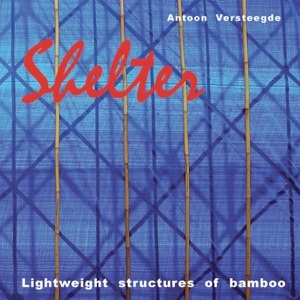 This 48-page booklet, written by the artist Antoon Versteegde, attempts to show in more than 100 colour pictures most of the transient structures of bamboo that he constructed since 1984. Versteegde gained ample experience with large-scale, interactive bamboo projects that have proven to be highly successful for realizing huge sculptures in a short time, working with groups of artists and volunteers. Price all over the world is € 10,- including shipment and a free copy of the 24-page booklet Shelter. You will receive your order by mail within 2 weeks. You can order by putting the amount on the Dutch bank account number IBAN NL72ABNA0410571261 of ArtWorksAndMore, ABN-Amro bank, P.O. box 10, NL-5400 AA Uden, The Netherlands, SWIFT-address ABNANL2A. Don't forget your name and address for delivery! Dünne Bambusrohre eignen sich - ebenso wie Weidenruten - für kunstvolle, filigrane Raumstrukturen und Objekte. Die Bambushalme sind kostengünstig zu erwerben oder können selbst gepflanzt und geerntet werden. Marcel Kalberer zeigt in diesem Buch über 100 Beispiele verschiedenster Konstruktionen und vermittelt, reich bebildert und mit detailgenauen Darstellungen und Erläuterungen, umfassend alle technischen, konstruktiven und künstlerischen Grundlagen dieser neuartigen Bauweise. Das Praxisbuch für jedermann, mit vielfältigen Anregungen zu eigenen schöpferischen Aktivitäten, Gestaltungen und Spielaktionen. Price all over the world is € 30,- including shipment and a free copy of the 24-page booklet Shelter. Dunne bamboestokken zijn - net als wilgentakken – zeer geschikt voor sierlijke, transparante ruimtelijke structuren en objecten. Bamboestokken zijn goedkoop in aanschaf of kunnen zelf geplant en geoogst worden. Marcel Kalberer toont in dit boek meer dan 100 voorbeelden van verschillende constructies en toont u zowel het ontwerp als de artistieke beginselen van deze nieuwe bouwtechniek met rijk geïllustreerd en zeer gedetailleerde illustraties en technische uitleg. 125 pagina's, vele kleurenfoto's en zwart/wit tekeningen; Duitstalig. Prijs is € 30, - inclusief verzending en een gratis exemplaar van de 24-pagina's tellend boekje Shelter. U ontvangt uw bestelling binnen 2 weken per post. U kunt bestellen door het bedrag over te maken op bankrekeningnummer IBAN NL72ABNA0410571261 van ArtWorksAndMore. Vergeet niet uw naam en adres te vermelden voor bezorging! Since 1996 UsterKreativ is a lively scene for creative design, culture, teamwork and love of life in the heart of the city model. From time to time, the festival keeps on reinventing and sprayed over a few days his magic right in the public space. 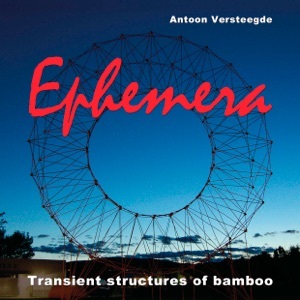 In May 2011, on the tenth anniversary, Uster Creative invites the Dutch bamboo artist Antoon Versteegde in to his first appearance in Switzerland. a goal. But the heart of the matter seems hardly anyone named. In an environment of cultural education arguments for projects to find that invite discussion about values of craftsmanship playful interventions and artistic productions of everyday spaces and putting them in a critical distance to focus on everyday school education. Seit 1996 ist UsterKreativ ein lebendiger Tatort für Gestaltung, Kultur, Zusammenspiel und Lebenslust im Herzen der Stadt Uster. In unregelmässigen Abständen erfindet sich das Festival immer wieder neu und versprüht über einige Tage seinen Zauber mitten im Öffentlichen Raum. 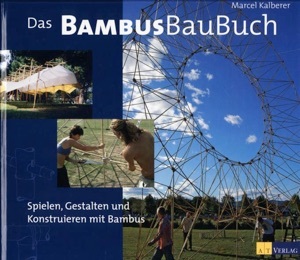 Im Mai 2011, zum zehnten Jubiläum, lädt UsterKreativ den holländischen Bambuskünstler Antoon Versteegde zu seinem ersten Auftritt in der Schweiz ein. eine Zielsetzung. Aber den Kern der Sache scheint kaum jemand zu benennen. Im Umfeld kultureller Bildung sind Argumente für Projekte zu finden, die zur Diskussion über Werte von handwerklich verspielten Interventionen und künst- lerischen Inszenierungen von Alltagsräumen einladen und sie in kritischem Abstand zu Schwerpunkten schulischer Alltagsbildung setzen. The singular virtues of bamboo, one of the world's most important construction materials, are being rediscovered: not only is it extremely cost-effective and durable, it also has a unique aesthetic appeal, whilst its internal structure is remarkably similar to more high-tech materials. 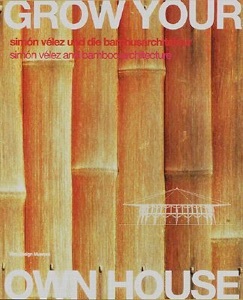 Columbian architect Simon Velez (born 1959) has recognized the benefits of bamboo and put them to practical use in numerous buildings. 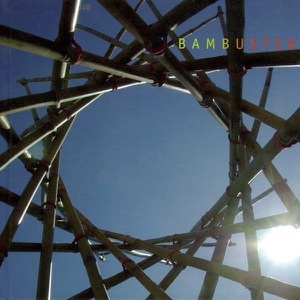 His project, the pavilion for the ZERI Foundation at Expo 2000 in Hannover-which, at a diameter of 130 feet and height of 55 feet is one of the largest bamboo structures in the world--is described in great detail.